Once you’re on a page/post/event editor, you can change the title, and change the page content using the editor in the middle of the screen. In most cases, select “Visual” for the easiest way to edit your content. Once you’ve made all the changes you wish, then click the blue “Publish” or “Update” button on the right hand side to make your changes live on the site. If you want to save your changes without publishing them right away, then click “Save Draft“. You can come back and publish the page later. If you want to add a picture or document into your page, then from the Insert menu select Add Media. This will allow you to either select an existing image, or to upload a fresh one from your computer. 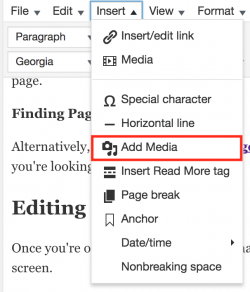 Use the “Add Media” menu to add pictures or documents into your page. Once you’ve added or selected an image, then click “Insert into Page“. You can upload both pictures as well as documents. If you are uploading a document, please try to use PDF files, as these are readable on most devices, including mobile phones. 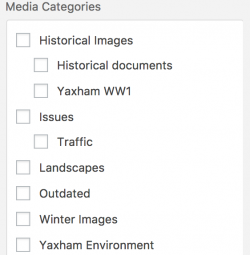 After adding an image, please take a moment to select one or more media categories to put it into. Doing this will help you to find your pictures later.